After careful consideration, I’ve decided to stay with my existing positions. I’m exposed to the markets where I would add, and am happy with my exposure. If we push back up towards the highs from here then fine, and if we make the lower low with divergence I will add more there. John, you are giving away your trade secret. Lol. I am praying for (the possibility) of this day and we have got the tools to spot it. and if we waterfall down (ala last July or spring ’10 where nymo kept going down from these levels)? the last 2 weeks even the bears have been calling for a “bounce” thus no surprise we’ve continued down. the 3 peaks and domed house is playing out perfectly. we are either in pt 24 (where a bounce should be near) or we are in pt 26 where they’ll be more pain before a bounce. either way “death” will follow these bounces. I’m still seeing people trying to stick to new highs on the year coming (and even new all time highs) which is just the recipe the mkt needs to further surprise to the downside (you are still sticking with this view as well correct?). 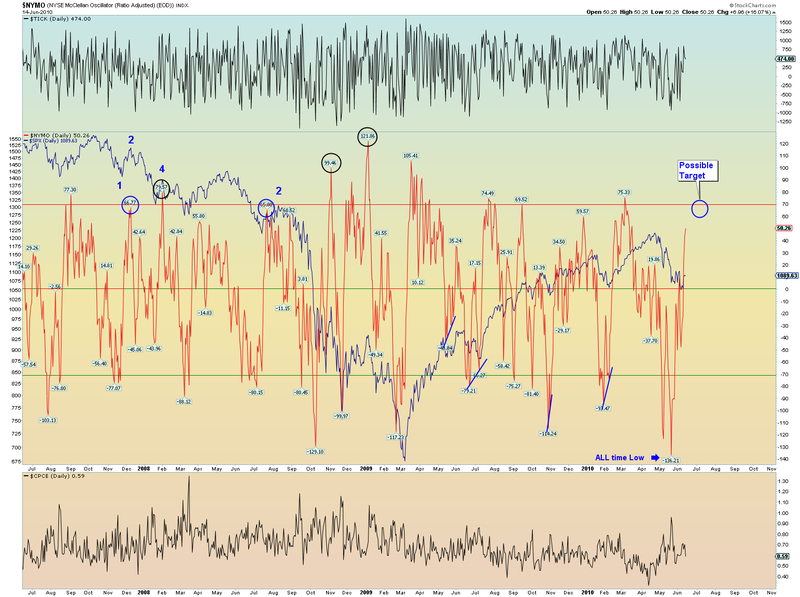 buckle up bulls, your in for an even rougher ride in 2013 (“if” it even waits til then). I’d be interested to know what it is about 3 peaks and a domed house that appeals to you. To my knowledge, there has never been any logical reasoning offered for such a complicated pattern and there is a marked absence of concrete examples from history of the idealised pattern actually playing out. 3 peaks and a domed house is technician George Lindsay’s work. Carl Futia is a student of Lindsay’s work and Futia’s interpretation and updates can be found here. The (rare) pattern is a series of chart patterns combined. thanks Edwin. as he mentioned it is a rare pattern and has been tracing out to a tee. look it up John. if it continues to play out as you stick with the bullish stance you’re liable to be disappointed to say the least. sure we could get a bounce (maybe even up to the low 1400’s if the bulls are VERY lucky) but then again, we may not, either way highs are in looking at the charts and not all the other gobbly gook. I’ll put it more bluntly. No historic evidence + no reasoning = no value. If you can show me historic examples of 3 peaks and a domed house playing out accurately together with reasoning as to why such a complicated pattern would play out, then I will happily change my mind. I am aware it’s doing the rounds again currently, just as it has done several times over the years since I started trading, only to always disappoint. obviously not the only thing that I’m looking at regarding my view. at the very best you may get 1450 (but again 1420 likely the max if that). keep looking for the new all time highs and I’ll be happy to continue to take your coin in the months to come (no worries here). let me put it more bluntly, assuming we get a big bounce (which is still an “assumption” as even the most STAUNCH bears have been looking for one as we’ve continued down) December will most likely hand your head to you. If we slide all the way through November then you’ll get your bounce in Dec but that will just delay your decapitation until later Dec or in Jan. FWIW I’m partially hedged as of yesterday because the charts are aligned for a bounce but I won’t hesitate to bail on another leg down as the risk to the downside is too great (and this hedge will go bye bye on a move of 4-6% up from here). if we go to a new high on the year then I’ll re-evaluate but not until then. Kudos. Love your work. Been following along for some time now. You posted an invite back a few weeks for comments on the number 19. Interestingly, there are 81 known stable elements in the universe according to Dr. Plichta. He refers to the number 19 as a universal building block. In both biochemistry and nuclear chemistry there are 19 amino acids and 19 nuclear isotopes that are ‘left oriented’ (most aminos are left oriented except sugar). That would be 1+19 or a fundamental equation relating to most organic structures (there are a total of 20 amino acids apparently). He mentions 19 consonants in language as well and references some tantalizing observations in regards to the synodic cyle of the moon (29.53 days) as compared to the orbit around the earth (27.32 days). There may be a tie in somewhere here with your elegant theory. Plichta’s book is called God’s Secret Forumula. All the best John. Here’s hoping for a bounce. Thank you sir! And very interesting stuff – I have made a note to look into that. Appreciated. Good stuff John. Yes, I think we are on pace for a bit of a rally here, however longer term down. I think rally can go into mid-December but we will not reach the highs of 2012. Most likely frustratingly higher for both bears and bulls (maybe many fake outs). As I posted before, I like and hate names: I am still long Intel and silver, still short AG and LPX as well as SPY and TLT. Looking to get long EXC, GLW, and possibly STX. Looking to get short LL and CONN.
One indicator that I am keeping a close eye on is the 13-week treasury bill. While this seems mundane (at best), it has been an interesting signal to where equities want to move on a given day. I hope you do not mind if I post my new blog (which no one will read like yours, but gives me comfort to my idea’s). If so, please remove this post and I apologize. Just my idea’s but more over, just charts with short descriptions. No where near as neat and informative as yours. Thanks for your reply to my email as well. You are right – I guess we are way more “correlated” in our trading strategies than I thought. Best of luck with your blog, Ryknow. May want to look at another perspective on 3pdh – rmarketweeklyupdate.com by Nu Yu. Always learning. Thanks John for all the good insight. I think Philly Fed just signalled we are close to a recession. That looks like an awful number for the US business confidence. Bulls insist on buying, but fundamentals continue to deteriorate. 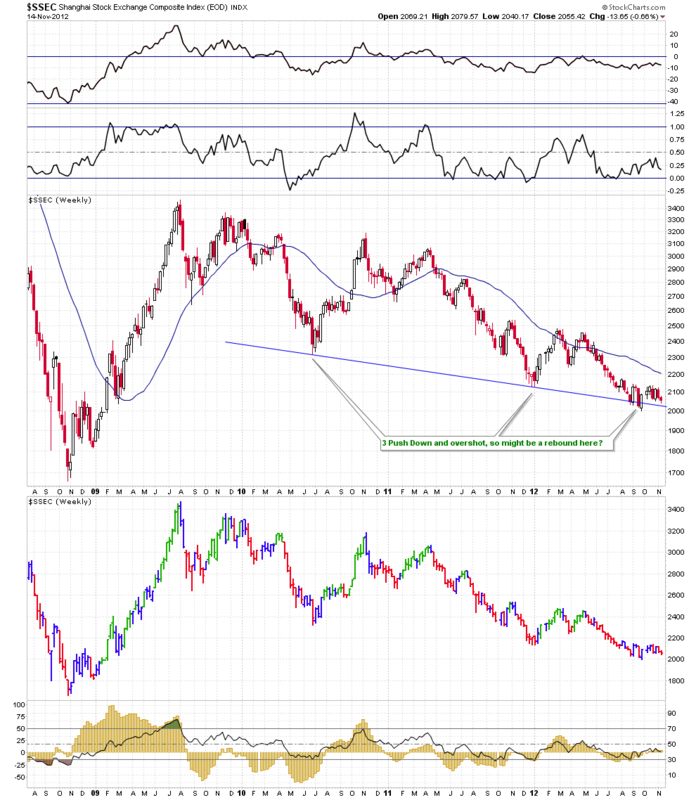 Middle East is a real wild card, because if a war breaks out, equities will get a lot more oversold. Israel is getting very aggressive. Finally, its safe to say that QE3 failed despite so so so many people on this blog proclaiming it as a “mother of all risk on” signals. According to Fed minutes, QE4 is now on the way. Leading and macro data round up in next post coming up. Any ideas to the Peutz Window coming up? Any research on this? Thanks for the amazing work. Hi Robert, and thanks. Long term readers will know that I persisted with Puetz crash windows for some time, but ultimately there were more misses than hits, so I dropped it. However, by my calcs it is 28 Nov to 7 Dec. When I read the stats about it, I could not sleep. Always buying out of the money put for those dates, in order to be able to sleep ;). Hi, first post, been following a while now. Great work and if I may say so, great attitude and approach. Apparently the Fed has not actually started QE3 yet. Turning the spigot off could be behind the drop ? There are some analysts who look at the Fed figures, and I wonder John to what degree you use that info. Many thanks M&M – and that’s news to me, so you are more in the know than I. Take a look at the Fed balance sheet figures – Factors Affecting Reserve Balances of Depository Institutions and Condition Statement of Federal Reserve Banks on the Fed site – there’s a weekly balance sheet report. it seems that to keep the market juiced, that there has to be a ‘flow’, not just ‘stock’. (i.e. continuous drip feed.) If the flow stops, then look out below. Especially as many of the macro boys are saying the markets are liquidity driver atm. If you can dig into the data, there’s something there. Lee Adler has also written some great articles on Cash to Primary dealers. I am not too hot on the actual analysis, but there are plenty of people around here who have the chops. Some of these flows seem to have an effect on the longer term, and others on the shorter term. Needs some brainpower to works out how it all fits together, but might be another useful bit of the puzzle. I do not trust on NYMO, is another indicator, but if you see in the first drop since march09, DOW -15% 2010 and DOW-20% 2011, is not very reputable. I would like to see it before 2009, John, in the bearish markets of 2000-2002/3 or 2007-09. Is possible you can bring those charts with the NYMO? Thanks a lot, John. My target DOW JONES in short term 12.000-11.700 may be in this or next week, is my bet from many weeks ago. There was also a geomagnetic storm K=6 yesterday. That is short term bearish. We may bounce next week but the Peutz Windows is worrisome if that theory has any validity. Current Sunspots at 126. If we don’t push hard up then load up with out of the money puts. Yes, that gemagnetic storm was forecast, and we should now have a quiet period for the rest of November. A new wave of higher sunspots and benign geomagnetism are both supportive for pro-risk. Despite all the gloom and doom Marc Faber appears to somewhat agree with your scenario. In this video interview he talks about market bottoming around Thanksgiving then rising to end of year. But he appears to still be gloomy for the long run. Cheers Jack – he’s someone whose forecasts I like to keep track of. Watch all those rising trend lines from March 2009 on US indices! If we get down there sometime soon with oversold readings, my expectations would be for a bounce, i.e. 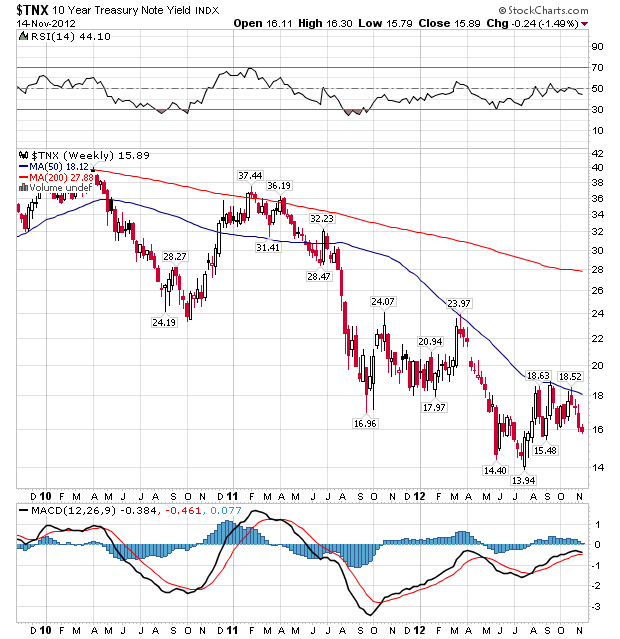 Christmas rally – to be shorted again just before Christmas. Ho ho ho! Then trendline test again into the end of Feb. 2013 and QE4 rocket shot! Does anyone have some info on the bond buying i.e. published stats? 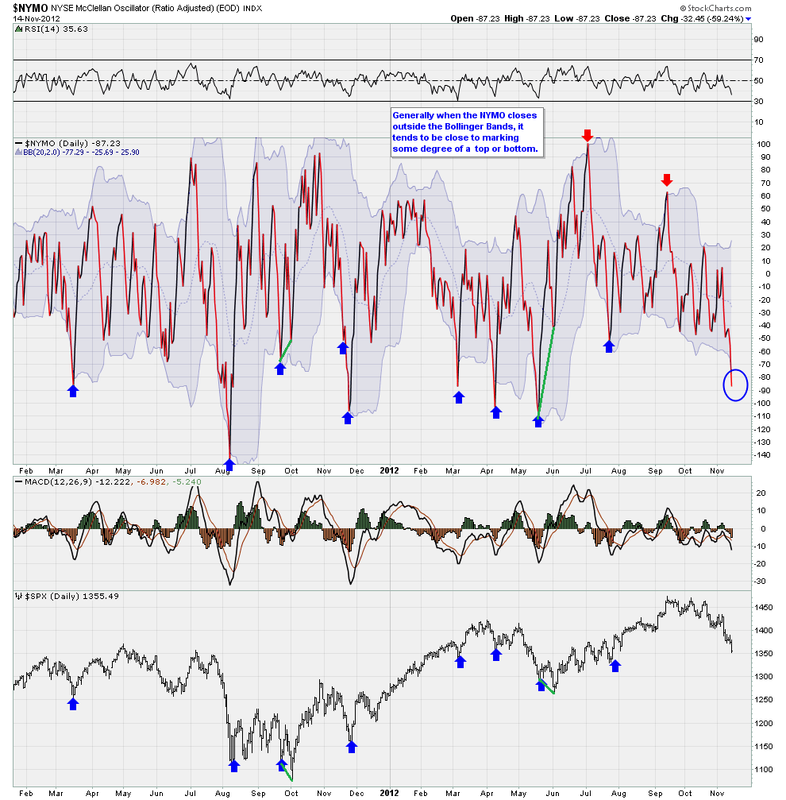 We are starting to see some signs that the equity market is becoming oversold from the short term perspective. One of my favourite charts shows that we are approaching internal breadth capitulation in the near term, especially thanks to Wednesdays strong selling pressure being a 90% down day. 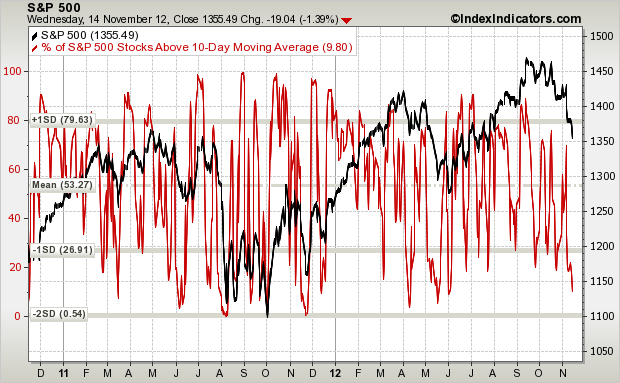 The basic 10 Day Advance Decline Line is also signalling oversold levels. Percentage of stocks within S&P 500 above 10 MA & 50 MA also hit a low reading associated with short term bounces (chart here & chart here). 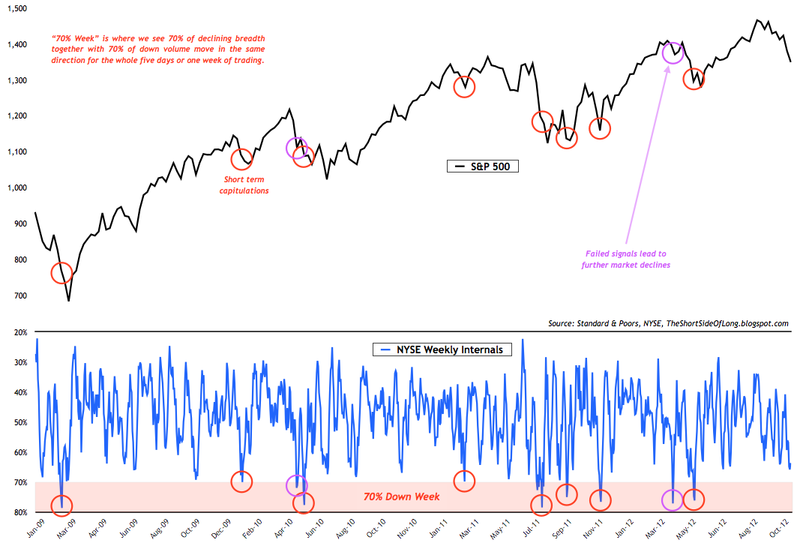 According to Tom McCellan, a well respected technical analyst, his own Summation Index is now also oversold. Furthermore, more than one fifth of the S&P 500 components now show an oversold RSI reading of 30 or below, while the index itself has also become oversold too. Finally, Bespoke website reported that 27 out of 30 Dow Jones components are now oversold. All in all, one could make an argument that a bounce or relief rally might be in store soon. However, be warned that markets remained overbought for a prolonged period of time in an uptrend, so they can just as easily remain oversold for prolonged periods during a downtrend. 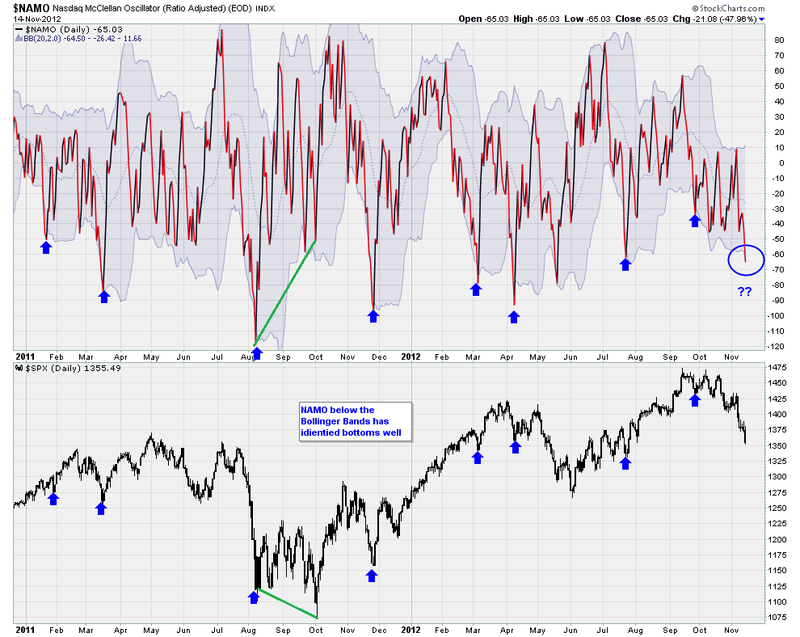 Also be warned that oversold readings work better when the price is above 200 MA, like we saw in June. All major indices are now below the 200 MA. With all that in mind, you still won’t see me buying equities. While short term oversold signals are fleshing in variety of areas, the market is not anywhere close to oversold from the long term perspective. The VIX does not even remotely suggest investors are in panic. Major sentiment survey and cash level indicators show that retail investors aren’t too afraid by the current correction. I personally expect much lower prices over the coming quarters as a long term investor with a recession and a drop in earnings well into 2013/14 area. The Puetz crash window is open from Nov 20 through to December 3 – this is where a lower high can be expected to take place from where the selling starts. Because this full moon will also be a lunar eclipse, we have a second crash window in late December.